Any whole grain can be ground into fresh flour using an electric coffee bean grinder. To prevent rancidity, always store whole grains and flours in the refrigerator or freezer, in sealed and labeled containers. Amaranth tastes slightly sweet and nutty. It is a cream-colored flour, ground from the seed of the ancient amaranth plant. It has a high moisture content, browns quickly and forms thick crusts. Amaranth works well in recipes that do not contain large amounts of liquids. Use amaranth flour as a portion (up to 25%) of total flour ratio in all purpose gluten free flour mixes and recipes for bread, pancakes, muffins, cookies and pizza dough. 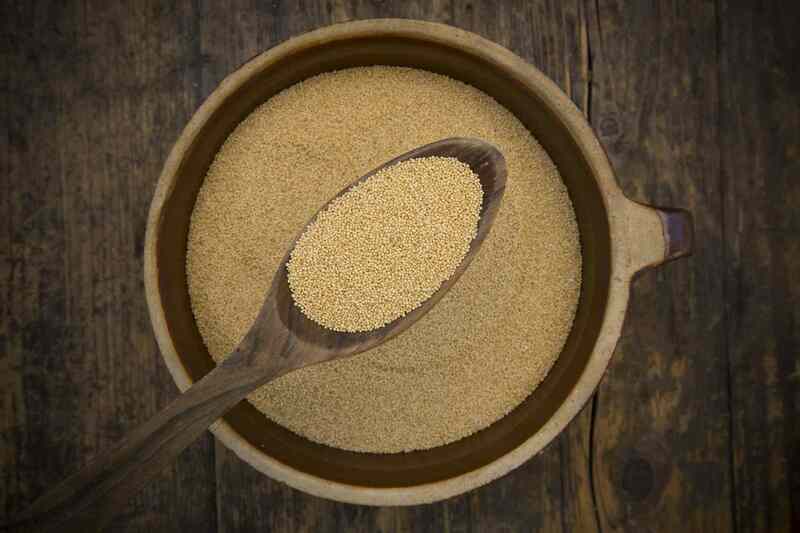 Amaranth is also an excellent thickener for roux, sauces, and gravies. Buckwheat is a strong, earthy-flavored flour, available in light and dark varieties. Use light-colored flour for best results in gluten free recipes. Despite its' name, buckwheat does not contain wheat- it's a relative of the rhubarb family. Buckwheat flour adds protein, fiber, vitamins, and minerals to gluten free recipes and can be used to make delicious pancakes. Kasha- not be-be confused with Kamut(wheat), is a whole grain cereal made from roasted whole buckwheat groats. Japanese soba noodles traditionally contain buckwheat flour. Read labels carefully when shopping for packaged buckwheat pancake mixes and boxed soba noodles- commercial products frequently contain gluten. Corn flour/masa haring has a light corn flavor and is the main ingredient in corn tortillas and tamale dough. Masa hearing, or dough flour is corn flour milled from whole corn soaked in limewater (water and calcium oxide). It has a unique, delicious flavor. Corn flour can be used to replace a portion of cornmeal in most recipes for a lighter, less crumbly texture. Cornmeal has a sweet flavor and crunchy texture. It is available in white, yellow and blue varieties. Blue cornmeal is especially high in antioxidants. Cornmeal is used to make cornbread, corn pancakes (Johnny Cakes), muffins, polenta, and is a good breading ingredient for fried foods. Look for "stoneground" products which are more nutritious than steel milled meals. Guar gum comes from the seed of bean-like (legume) plant, sometimes referred to as the Indian tree. It is high in soluble fiber. Like xanthan gum, measure carefully when using guar gum in gluten-free recipes or you may end up with heavy, stringy baked goods. This tiny grain is thought to be the oldest grain consumed by humans. Millet is an important source of easily digestible protein, vitamins and minerals for millions of people in Africa, Asia, and India. Fresh ground millet looks like yellow cornmeal and adds a light, sweet flavor and somewhat crumbly texture to baked goods. Cook whole grain millet like rice, for a nutritious grit-like breakfast cereal or as a substitute for rice and barley in pilaf and tabbouleh recipes. 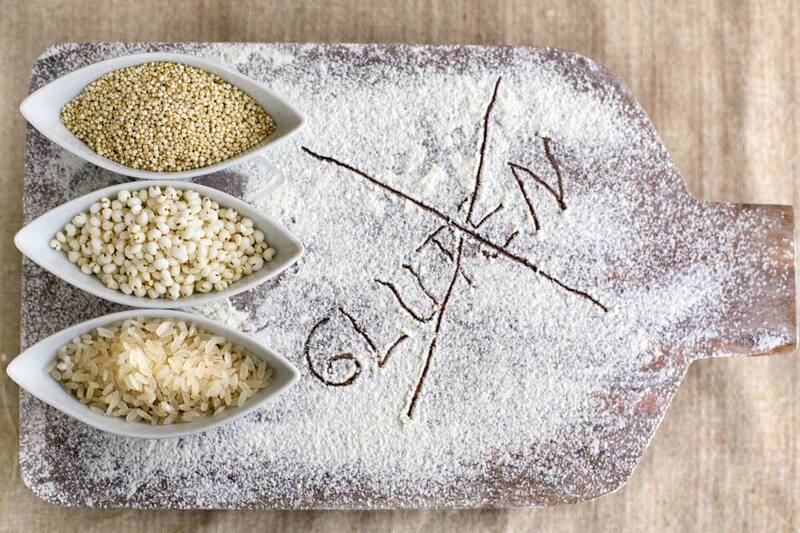 Add small amounts of millet flour to gluten free baking recipes to improve nutritional quality. Oats: Certified Gluten Free Only! Oats, with a nutty taste and chewy texture, add protein, soluble fiber, vitamins and minerals to gluten free recipes. Use gluten-free oats and oat flour in bread, pancake, muffin, cookie, cake, granola and muesli recipes. Museli is a hearty Swiss breakfast cereal. NOTE: The use of oats in gluten-free diets is controversial. Cross-contamination with gluten is common in traditional oat products. The Gluten Intolerance Group®, the Celiac Disease Foundation, and the Canadian Celiac Association approve the use of moderate amounts of "Certified Gluten Free Oats" but the Celiac Sprue Association recommends that oats be avoided. If you plan to use certified gluten free oats, start by using small quantities to make sure that you can tolerant them. Quinoa is a high-quality source of protein. This ancient grain was a major food source for the Inca civilization thousands of years ago. Quinoa is available as a whole seed, flakes, and flour. The seed can be used to replace rice and barley in pilaf, couscous and soup recipes. Quinoa flakes can be used as a substitute for rolled oats. Quinoa flour has a somewhat strong, bitter flavor, can be used in small amounts in gluten free mixes and baking recipes to improve nutritional quality. Prior to cooking, whole seed quinoa should be thoroughly rinsed in cold water to remove bitter "saponins", a natural coating found on quinoa seed. White rice flour and sweet rice flour add lightness and texture to gluten-free baked goods. Brown rice and wild rice flours add fiber and nutritional quality. Wild rice flour is a light brown, flecked flour with a pleasant, nutty flavor. White and brown rice flours are neutral-flavored, are somewhat gritty and make dry, crumbly baked goods. Use rice flours in combination with other gluten free flours for better texture and nutritional quality. Sweet rice flour, sometimes called “glutinous” rice, doesn’t contain gluten. It has a unique, gelatinous quality. Add sweet rice flour in small amounts to improve the texture and ‘chew’ of gluten-free baked goods, as a thickener in sauce recipes and to dust baking pans to prevent sticking. Sorghum, also known as Jowar or milo, is growing in popularity in gluten-free cooking. It's a high protein, cream-colored, smooth flour with a wheat-like taste. Sorghum doesn't have the gritty texture found in brown rice flour or the heavy bean flavor of gar-fava or garbanzo bean flours. Use this nutritious gluten free flour as a portion- up to 25% of the total flour ratio, in all purpose gluten free flour mixes and bread, muffin, cookie, pancake and pizza dough recipes. Teff is an ancient seed grain that has been an important food source in Ethiopia for thousands of years. Teff is high in protein and has a nutty, sweet flavor. It is available in white, tan and brown varieties. Whole grain teff can be used alone or combined with millet or rice in pilaf recipes. It can also be served as a hot, nutritious breakfast cereal. Add teff flour in small amounts to gluten free bread, muffin, cookie, pancake, pizza crust and cracker recipes to improve nutritional quality. Teff flour can also be used as a thickener in soups, stews, and gravies. Garbanzo (chickpea) bean flour is a high protein/fiber flour that adds moisture, good texture and nutritional quality to gluten free recipes. Garbanzo bean flour is also blended with fava bean flour to make "gar-fava" bean flour. These products can be used interchangeably in flour mixes and recipes. Bean flours are creamy-colored and have a sweet, bean flavor. Some manufacturers heat-treat bean flour during processing to make the flour more digestible, but some people do experience digestive distress when using bean flours. Use bean flours as a portion- about 25% of total flour ratio in all purpose gluten free flour mixes and recipes. Bean flours can also be used to replace brown rice in gluten free recipes. Soy flour is naturally high in protein and fats but it is available as a processed, low-fat defatted product. It is pale yellow and has a somewhat beany, strong flavor. It adds moisture and texture to baked goods and browns quickly. Soy is listed in the top eight food allergens, along with milk, eggs, wheat, peanuts, tree nuts, fish, and shellfish. Amaranth or sorghum flours work well as a substitute for soy flour in most recipes. Almond meal is made by grinding blanched (dark skin removed) almonds. It's a high fiber, high-fat flour that adds moisture, flavor, texture and nutritional value to gluten-free baked goods. Nut flours- including almond, pecan or hazelnut also make delicious coatings for chicken, fish or vegetables. Nut flours can also be used to replace powdered milk in most recipes, making them a useful, dairy-free alternative ingredient. Coconut flour can be used in small quantities in gluten free recipes to increase fiber content. It is almost 60% fiber, is high in fats and lower in carbohydrates than other GF flours. Coconut flour works best in recipes that include eggs and has a short shelf life. Refrigerate baked goods made with coconut flour to prevent spoilage. Chestnut flour is a light tan-colored flour made from ground whole chestnuts. It adds sweetness, moisture and texture to baked goods. Chestnut is traditionally used in rich Italian and French pastries. Arrowroot is used to make Kuzukiri, translucent Japanese noodles. Arrowroot is a powdery white starch ground from the root of the tropical herb Maranta. It is an excellent thickener in sauces, adds body and texture to gluten-free baked goods and works well as a batter coating or breading for chicken, fish, and vegetables. It can be used in place of cornstarch in recipes. Potato flour, not to be confused with potato starch is ground from whole potatoes. It is cream-colored flour with a potato flavor. It is a moist, heavy flour- use it in small quantities in flour mixes and recipes for gluten free bread. Potato starch is a refined starch used to add moisture and texture to gluten-free baked goods. Like other starches, including cornstarch, arrowroot, and tapioca, potato starch is high in refined carbohydrates and low in fiber and nutrients. Use in all-purpose gluten-free flour mixes and recipes for light, fine-textured baked goods. Tapioca starch is ground from the root of the tropical cassava plant. It's used extensively in commercial gluten-free products and recipes. It is a flavorless, high carbohydrate starch and, like other starches used in gluten free cooking, it is very low in nutrients. Use it as a portion- up to 50% of total flour ratio, in all purpose flour mixes and recipes to lighten the texture of baked goods. It is also used in batter coatings and breading recipes for crisp, golden crusts. Combine nutritious gluten free flours with high starch flours to improve the nutritional quality of gluten-free cooking. Xanthan gum is a corn-based, fermented product. It is used extensively in the food industry to make products thicker and it's a common ingredient in gluten-free recipes. If you use too much xanthan gum in a recipe you may notice a heavy, gummy or even "slimy" texture in your baked goods- so measure carefully when using xanthan gum. People with allergies or sensitivity to corn may be advised by their physician to avoid xanthan gum. Also, xanthan gum generally costs almost 3 times as much as guar gum.